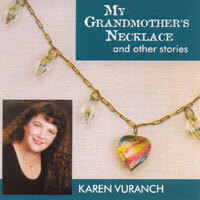 Karen Vuranch has been performing traditional stories and oral history for many years. My Grandmother's Necklace and Other Stories is her first recorded collection. Karen tells family stories passed down from her grandparents in "My Grandmother's Necklace," "Fred and Francie" and "The Clock on My Mantle." She also tells stories she has collected from indomitable West Virginia women in "A Place to Hide Your Money" and "Grace Haught of Wetzel County." Ghost stories have always been a big part of Karen's repertoire and she includes several in this recording. "Rose and Charlie" is a ghost story set in a West Virginia coal camp. "Carry Me Home to Wales," told with permission from Jon Manchip White, is a ghost story that travels from Wales to West Virginia and "Thomas' Journey" is a traditional Appalachian scary story. Dan LeRoy, of Graffiti Magazine, called it "an entertaining and worthwhile collection." When Hallie Marie was a little girl, life was simpler. She walked to a one-room school and her biggest problem was that "mean ole Jimmy Kent." But life goes on in a West Virginia coal mining camp of the 1920s and Hallie Marie grew up. She fell in love with Jimmy Kent, married him and raised a family. Life didn't seem so simple now and, after Jimmy dies in a mine accident, Hallie is faced with raising her children alone. 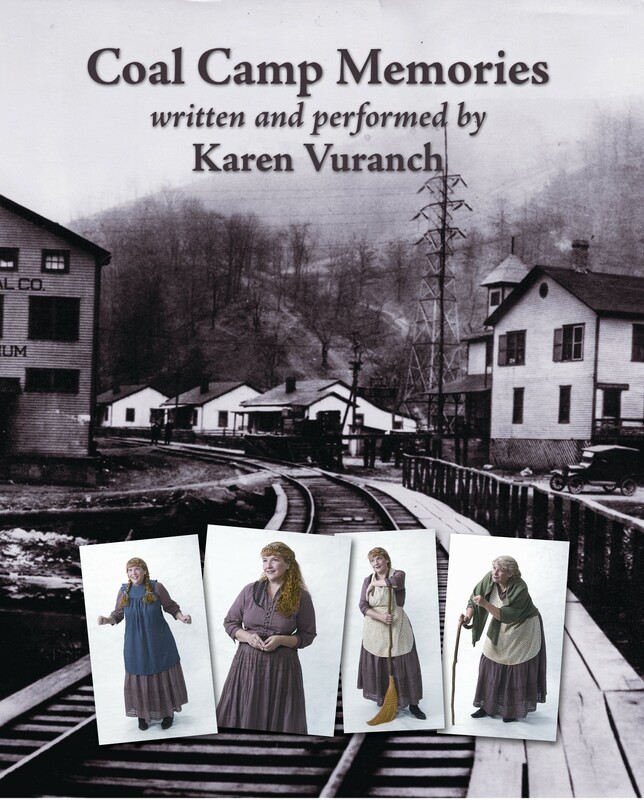 Coal Camp Memories is a one-act play, written and performed by Karen Vuranch. Karen conducted historical research as well as many oral history interviews with those who lived in the coal fields of West Virginia. The result is an important dramatic work that celebrates the lives of women in coal communities. Hallie Marie's story is a composite of many people who lived during those times. Vuranch ages in front of the audience and grows from an exuberant ten-year-old, to a demure teenager, to a young wife, to an old woman wise with years. During the scene changes, traditional musicians play Appalachian music.Coal Camp Memories is a tender and poignant story that will recreate an era for you as well as delight audiences of all ages. Christy Bailey, of the National Coal Heritage Area said, "A "must see” performance that presents a unique glimpse into the culture and history of coal mining communities through the eyes of Hallie Marie and the considerable talent of Karen Vuranch." Potluck is a feast of stories, songs, and poems that will satisfy your soul, lift your heart, and tickle your funny bone. Karen Vuranch, Julie Adams, and Colleen Anderson have gathered their very best and very favorite pieces about cookery and community — and the connections between them — into an hour-long live performance that’s full to the brim with laughter and love .Can’t get to a live show? Or maybe you want to hear it all over again? You’re in luck. 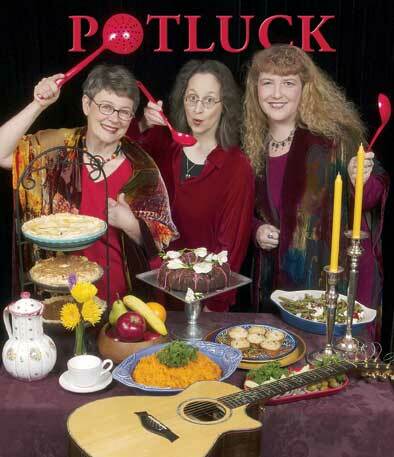 We have put our Potluck show on CD, from start to finish, with every single song, story, and poem just the way we perform them...except that we couldn’t resist adding a few extra harmonies and instruments. Recorded and mixed by Bob Webb, it’s a great keepsake and a wonderful gift. Also available to listen and buy online from CDBaby.com. "I listened as I made butternut squash soup tonight. I haven’t eaten it yet, but I’m willing to bet it's the best batch ever! How could it not be with that much beauty, love, inspiration, fun, joy poured into it as I cooked?" (automatically included if you order via paypal).